Tough low profile shower tray made in 2.5mm thick steel coated with with a super hardwearing stove enamelled finish baked on at 850°C. This level access tray is so hard wearing that it is acid, impact resistant and scratchproof with each tray supplied with a 30 year manufacturer guarantee. 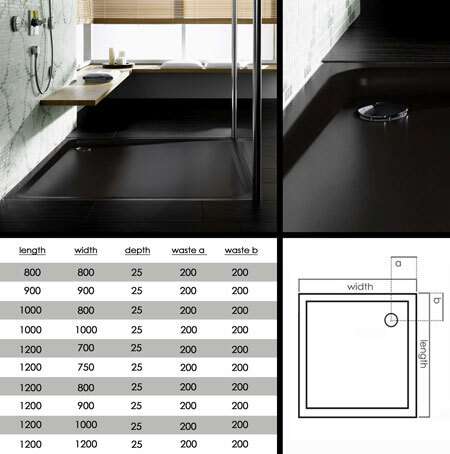 Each black shower tray has an overall edge thickness of only 32mm and is designed for flush level access on the entrance edge. cream, beige, grey, pink, green and lilac. * Made of solid steel. * Black, other colours available. * Stove enamelled wear surface. * 10 shower tray sizes. * Anti slip finish to special order.